London Bridge Underground and Railway Station is a minutes walk away. 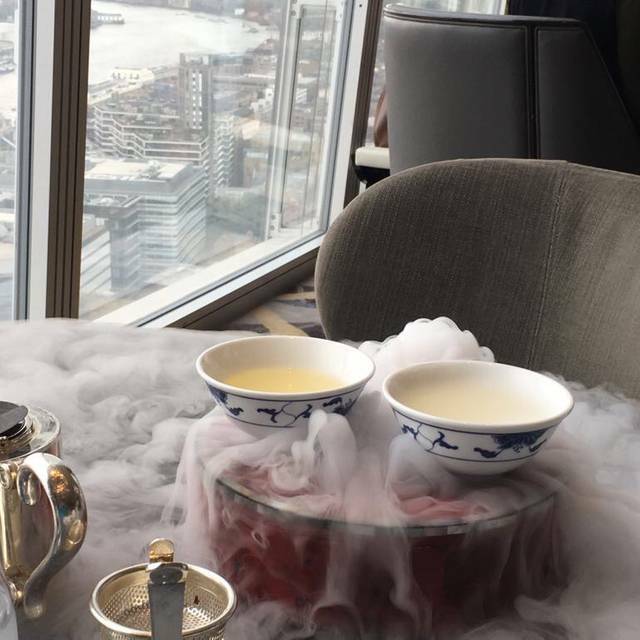 TÎNG, named after the Chinese word for ‘living room’, is the collective name for the restaurant and lounge on level 35 of Shangri-La Hotel, At The Shard, London. 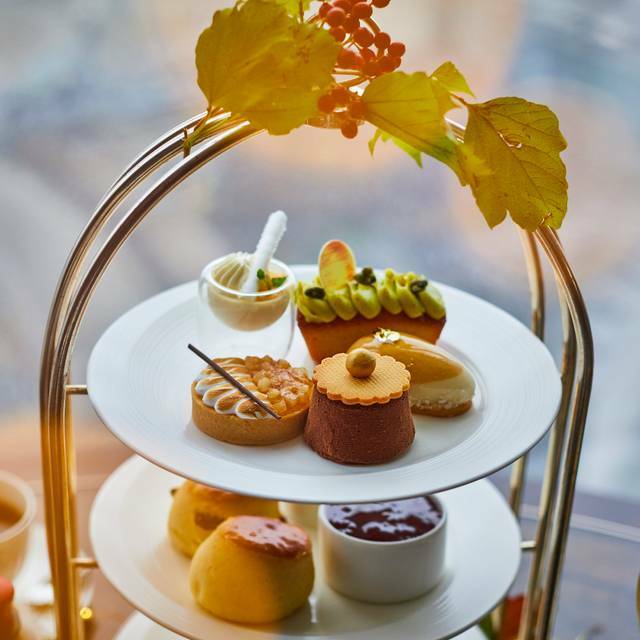 Served in theatrical elegance, our Afternoon Tea celebrates the best of British classics , as well as a fine selection of sandwiches. 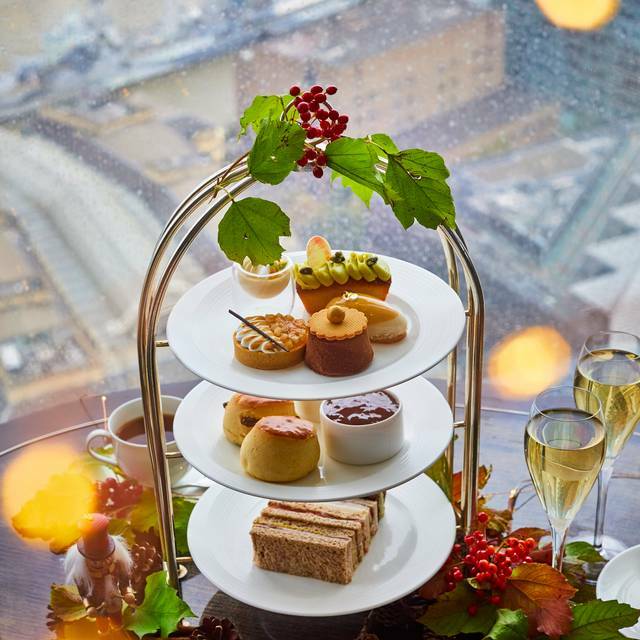 The beautifully displayed sweet and savoury treats comes complete with an exclusive selection of over 30 teas, all complemented with the best views across London. Was given this as a gift, would not spend the £52pp+ on this, could have a much better experience elsewhere. Service is average and expected more from the Shard and also how many waiters/waitresses there are. We asked if we could move tables, she said she would check and never came back, we was 3 rows from the window so there was no view for us. Was also supposed to include Iced tea which we never received. Food is also not worth the price, the best thing was the deserts. The Sandwiches are nice but only average. 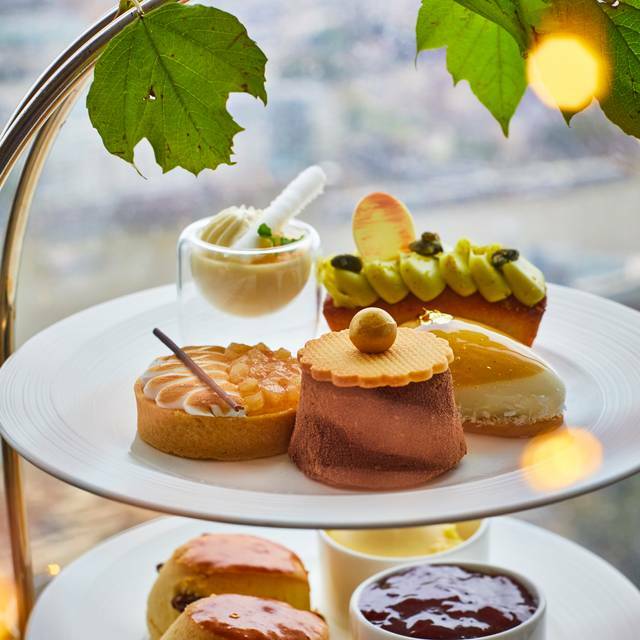 Overall for the money you could get a much nice Afternoon Tea elsewhere in London. Our table was booked at 1pm, we arrived on time & were seated. Our tea arrived , but our tier of afternoon sandwiches, scones & deserts didn’t arrive until we’d been seated for 1 hour. I don’t think this is acceptable. We weren’t offered the Easter cake that should also have been served, I had to ask for it when we paid the bill. The service from Christian ruined the entire day. Highlighted how poor it was and then he over compensated for the remainder of the day. Will never eat there again! Staff were lovely and welcoming, fantastic value for money when it came to the amount of food. Was a little disappointed that we didn't get a view looking over the city but housing and the rail line instead, as we were seated in a different area of the restaurant. Sandwiches were dry but didn't bring down the overall experience at all! Would 100% recommend to anyone, would definitely go back! Very nice view but had to insist for a window table. At least 6 different waiters for just a teatime. Sandwiches are basic, scones are ok, pastries are not refined. And from 4.30PM, they said the "kitchen was closed"... Then why allowing people to come in at 4PM? A weird experience overall. Food was average, champagne was flat I had to ask for a fresh glass. Service was excellent and the views are incredible so worth a visit. But overpriced for what it was in my opinion! Waiting staff were acting very unprofessional! Expect for one gentleman who was very professional! Food wasn’t the best! Cakes were very dry and service was very slow! At points myself and my partner were waiting for service longer than required! Very disappointing and not the service you’d expect from Shangri la! Very enjoyable afternoon tea. The food and service was great and the view was stunning. The pianist was fabulous too. Wow, this experience was a memory for life. The view is amazing! I took my mum for afternoon tea as a birthday treat, along with my teenage daughter. 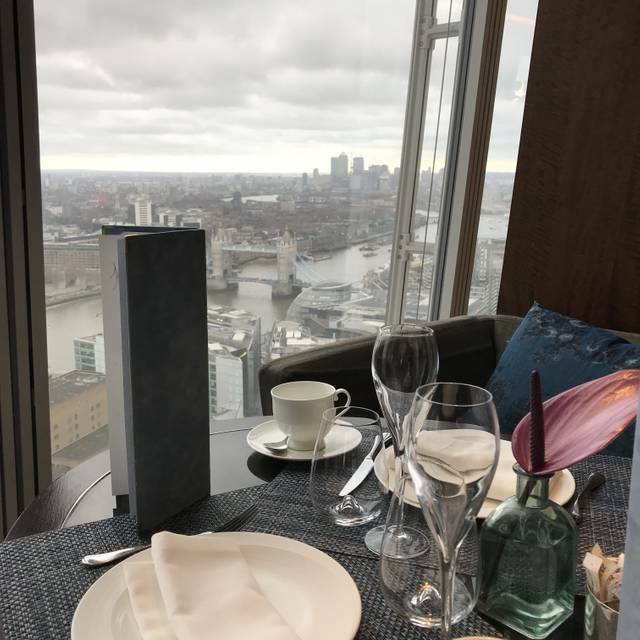 The staff from the ground floor up were lovely and the table position was very nice with lovely skyline views. Our waiter was very friendly and witty, and explained to us about the afternoon tea service. The food was really lovely, the patisseries were beautiful to look at and the special tea presentation at the beginning was a quality touch. My only negative is around the service after the initial welcome etc - there was a mix up with the tea service (the wrong tea arrived at the table, and we never did get what we had ordered in the end), and we seemed to lose the waiters attention so we weren't approached to see if we wanted more champagne or tea during our stay. At the end the cloakroom struggled to locate my coat. At over £210 for the three of us including a hefty service charge I did feel disappointed that the service had not maintained its impressive start. The atmosphere is quite good and the service is excellent. 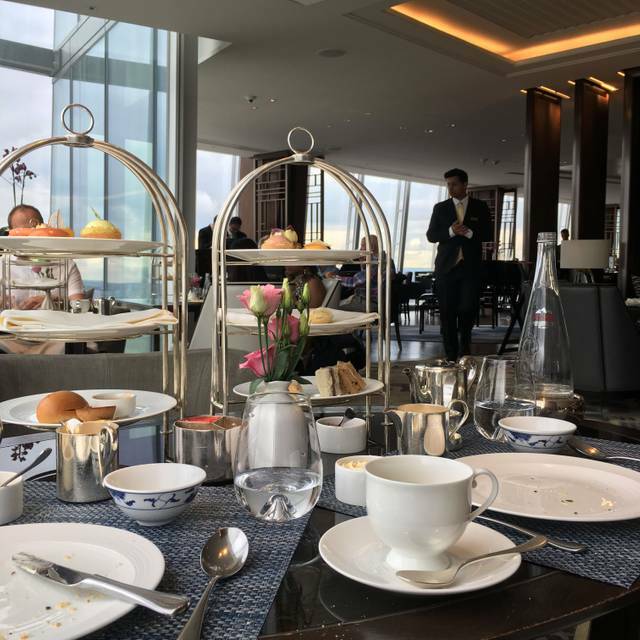 We did afternoon tea here a few days after having going to the Ritz and were incredibly underwhelmed by the Shangri-La. The staff was polite, but not very attentive. We had a reservation and they put us at a tiny table right next to the kitchen and barely even in the dining area. I had to flag the waiters down multiple times to remind them about our requests. They brought me the wrong pot of tea, never ended up bringing a new plate of scones, and I had to ask for the dessert cakes, which are usually served to you mid way into the service. The food was good, but the service was nowhere near what we expected from a 5-star hotel. This is one of the unique experiences available in London. It is unusual and fun to be high in the sky. The tea and the general ambience was second to none. If I have any criticism it concerned the noise level which was loud - i suspect only a reflection of the excitement of being in the Shard. Amazing experience - totally recommend it. Food was brilliant and plentiful. Servers were extremely attentive. Class act. Positives:definitely great for the view, the ambience is great. Sandwiches were ok. Live piano. There were some extras which was nice palette cleansing tea with liquid nitrogen which was a lovely touch and some extra cake at the end. Amazing afternoon tea! Great service, great atmosphere and great food. The scones are to die for! 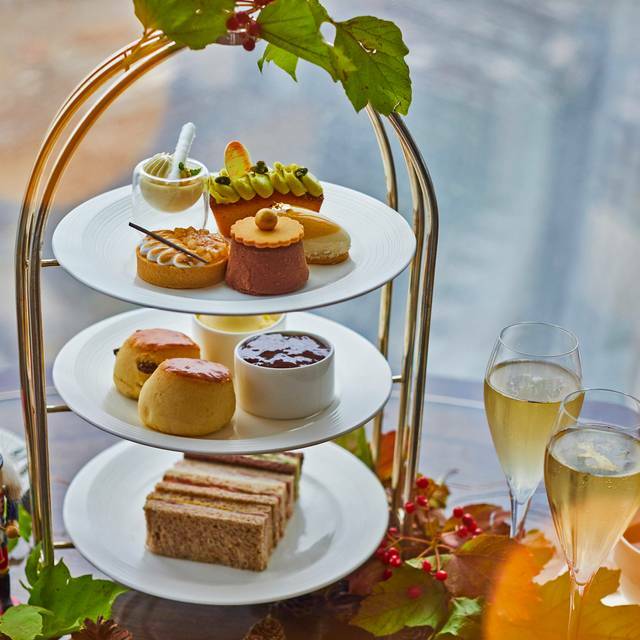 We thought this was a fabulous afternoon tea. Service is slow but in a city where everything is so frenetic, it was a refreshing change to just sit back and enjoy the ambience and the delicious food at a slower pace. Some might find this frustrating but we felt looked after without it being irritating. Everything was perfect, would highly recommend to anyone looking for an unforgettable experience in London. Thank you - my guests had a fabulous time. The view, the food, the service is wonderful. We keep recommeding this afternoon tea to friends and family. This is our second visit to Ting and was disappointed how much the service has declined. We were at the table for 45 mins before we even get the menu. For 60 pound per person, there are other restaurants that also has great view with better quality food. Very frustrated! We had to ask twice for our Champagne, it arrived after we had eaten our sandwiches. We were told just ask for extra teas, sandwiches, cakes etc. We asked for extra sandwiches twice it took half an hour to come! We asked for extra cakes they didn’t turn up before we left. Very disappointing as it was our 43rd wedding anniversary. Been there twice before but not going back. The location is very good. It is a pity that there is a round cup left on the table. Live piano music is very good. Thank you for the wonderful service for the traveler. 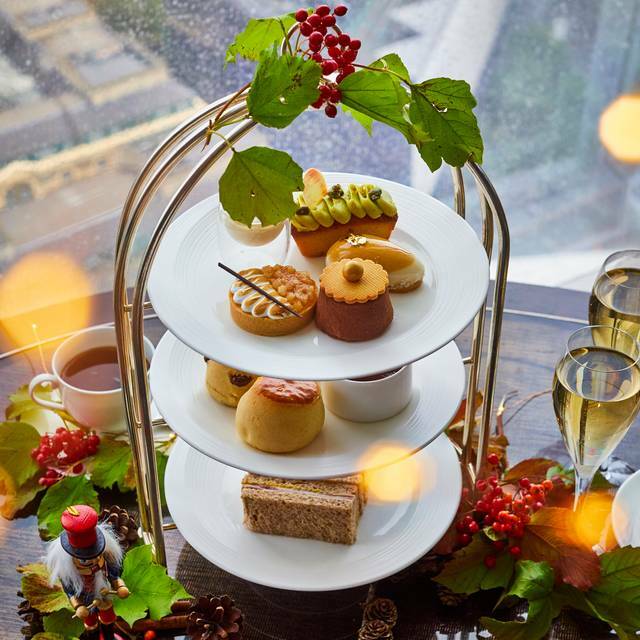 An amazing afternoon tea! Was for my mother for mothers day. She loved it! This was my second visit for afternoon tea, the first was very very good. However the second visit with friends was very very disappointing. Although the staff are very attentive our waiter got our requirements wrong, this may have been a communication issue but I also feel that he was rushing and the first pot of tea served was cold. It wouldn't have been such a big deal but he got it wrong again after the issue was pointed out to him. That said the manager did his best to make it right. We were given apologies a free glass of wine, but I would have preferred a better experience. In addition, the quality of the sandwiches were not what you would expect or anticipate from any restaurant. Some of the bread was stale and we were informed that the restaurant used margarine and not butter. I put yes to recommend friends because my first experience was very good and there was not option for unsure. The service was dreadful. A cup of tea was poured, no milk, three requests for milk it never appeared. Therefore cold black tea. Finally replaced still no milk! They say that they will replenish any items some came others did not. For such an expensive afternoon tea for a special occasion I would give it a miss. The most amazing experience, service was outstanding! I took my mum for her birthday and we all thoroughly enjoyed it!!! 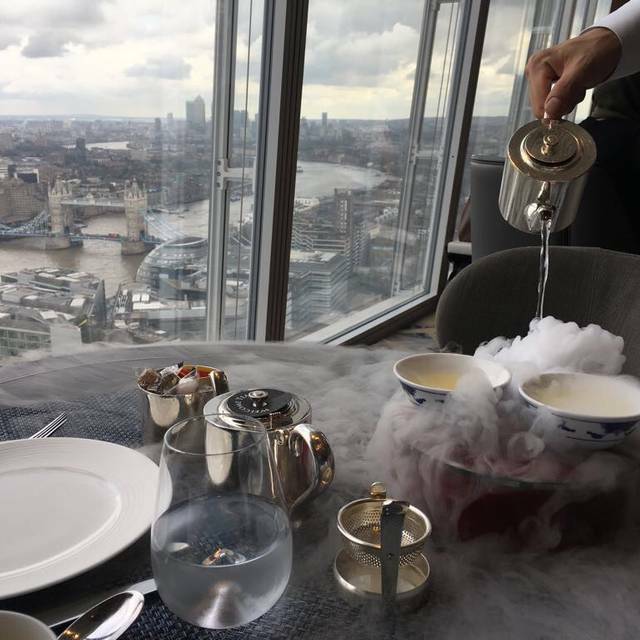 My experience at The Shard, Shangri-La was exceptional. The staff, service and food was an outstanding experience. I certainly would recommend the afternoon tea service to any. They cater to anyone who is gluten free, also the view and the pianist playing the piano took the experience to another level. The view smacks you in the face when you come out of the lift. Great place to have afternoon tea. The view is amazing. All the staff are friendly in a genuine way. You feel like they truly want your visit to be memorable. Great afternoon in London. Don’t pass up this opportunity.